I promised a post on search engine optimization, and as I dial in on my drum DVD and web show, it’s at the front of my mind.I’m going to go ahead and recommend that new readers read the first couple of posts to get the gist of this blog, rather than devoting 50% of each new post to bringing everybody up to speed.I will, however, supply some new details. I have a web show. It’s called Shed Science with Nate Smith (http://www.youtube.com/user/ShedScienceShow on youtube, and look for www.ShedScienceShow.com soon), and I just learned a lesson from a minor wasted opportunity. People will usually only watch a new episode once, so the per-viewer half life of each episode is short. Once posted, you want a click on that episode to redirect users to the correct YouTube channel, where they see an ad directing them to the correct website to see more, where they’re prompted to subscribe, and to click a button to “like” your Facebook page, which in-turn directs new users to the Facebook page, which prompts them to “like” and share content, and to subscribe to the YouTube channel, etc. And I posted an episode from my personal Facebook page, which directed viewers to my personal YouTube page, where they encountered a dead end.And it’s here that most arts-related content goes to die. There’s a gravitation pull that few artists escape, and that’s the 250-some fans threshold. I have only anecdotal evidence, but I have a couple of theories as to why. -Most artists don’t think beyond their existing network. My network – New York musicians – is probably the most jaded, overstimulated group in the universe. We’re constantly besieging each other with our gig invitations, gig videos, album release parties, etc., but instead of thinking beyond its borders most musicians continue to “share” things only with a small group of Facebook friends. -Related, many of us don’t think very carefully about our content. Do I really want to watch another grainy, low-fi iPhone video of a thirteen minute tune? No, and I’m a jazz musician. If I can’t sit through it, it’s doubtful anyone else will. It’s true, the music should speak for itself, but at a live gig our attention can drift, and we’re still in the room. If you lose somebody’s attention in a video they’re already looking for the next thing to click on. My plan is to put a lot of effort into two things – getting a couple of early guests who fit the Venn diagram of interesting/inspiring people and people with a broader platform than mine (and people for whom appearing on the show is beneficial, so it’s a “win win”), and having an architecture like I described above in place by the time it’s time to drop the next few episodes. All of this is just incidental to creating a great show, by the way – the web show is purely a labor of love. It’s my DVD for which I’ll need to apply all the lessons I’m learning about network-building and SEO. For that I plan to use a loophole in google’s keyword retail model – I’ve written previously about the ballooning cost of Adwords campaigns, where you can expect to pay at least a dollar-a-click for most quality search terms. But there’s one place where keywords are completely free: YouTube. By following the Free Content model of other sites like FreeDrumLessons.com, I hope to generate traffic and direct users to my site who will eventually pay for retail content. 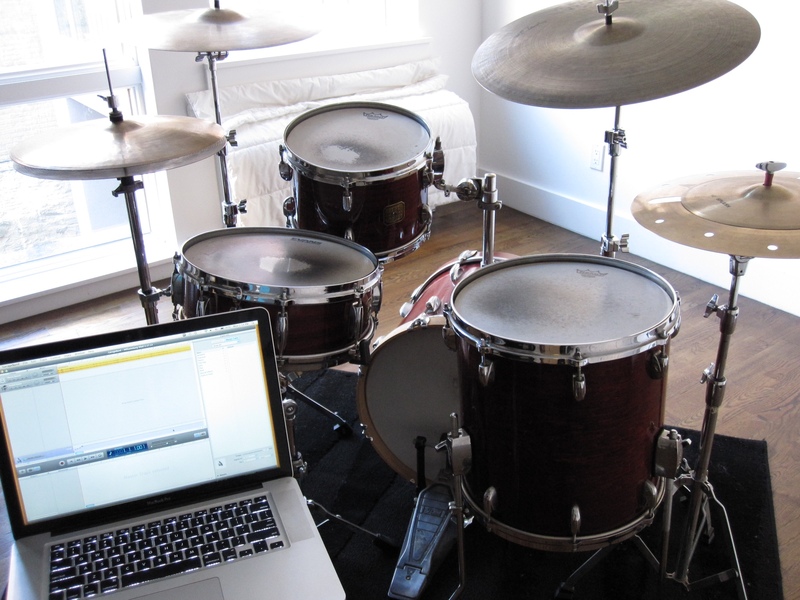 1) Within the broad category of “drum instructional material” I was able to find a pretty potent niche – Audition Preparation. True, there’s a drum DVD for every day of the week, but the vast majority is either celebrity-centered videos (Thomas Lang, Carmine Apice, etc), or instruction for “vanity skills” like faster double bass drum chops (yes, that gets thousands of searches a week). Nowhere was I able to find a product showing a user how to use his or her time in the practice room to improve quickly! So – Kaplan for the drums it is. The 80/20 drummer tested well on Adwords, to boot. I’m going to hold off on speculating and devote future posts to real-life lessons learned, but wanted to give you an insight to my SEO plans.